Instant Pot Ultra 8 Qt 10-in-1 Multi- Use Programmable Pressure Cooker, Slow Cooker, Rice Cooker, Yogurt Maker, Cake Maker, Egg Cooker, Sauté, Steamer, Warmer, and Sterilizer $119.95(Reg $149) + Free Shipping. Lowest price it's ever been, this is the best thing ever! 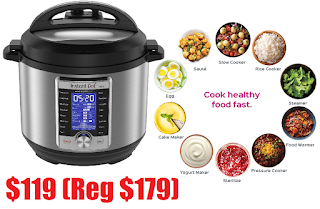 Instant Pot Ultra 8 Qt 10-in-1 Multi- Use Programmable Pressure Cooker, Slow Cooker, Rice Cooker, Yogurt Maker, Cake Maker, Egg Cooker, Sauté, Steamer, Warmer, and Sterilizer $119.95 (Reg $179) + Free Shipping.This is the Ultra version and has every possible customization feature on it. You will absolutely love this, it is the best thing ever! Lowest price it's ever been.